For the first year ever, I've had some Anna's hummingbirds coming to my feeders. Unbelievably, these tiny birds stay over the winter and face some challenging conditions, to say the least. Last night we got a couple of inches of snow and it covered the hummingbird feeder. That didn't stop this female hummer from enjoying an icy beverage though. You might wonder how these tiny creatures can survive in such extreme conditions. 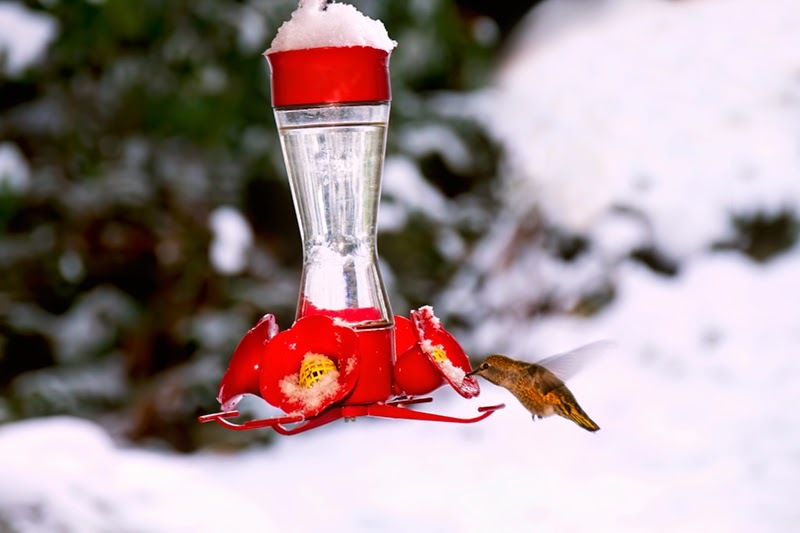 In order to survive cold temperatures, hummingbirds can enter a state of torpor. This state is similar to hibernation but more short-term. Hummers drop their metabolic rate to 1/50th of what it would be at their normal body temperature. While in a torpid state, the hummingbird’s heart ranges from 50 to 180 beats per minute...to give you a comparison, the normal heartbeat of an active hummer can be as high as 1200 beats per minute. In a torpid state, a hummingbird's breathing becomes irregular, with long periods of no breath at the lowest temperatures. I usually get Rufous hummingbirds at our feeders but they leave in August in order to migrate all the way from Canada to Mexico, where they spend the winter. Now that's a sensible hummingbird! But I do love the occasional snowfall and it seems my Anna's friend doesn't mind either. I can see her out there right now, doing double-time at the feeder in the hour before sunset. Tonight I think I'll take the hummingbird feeders in though so that my feathered friend can enjoy some warm nectar first thing in the morning. Labels: hummingbirds "anna's hummingbirds" "winter birds" "snow birds" "winter hummingbirds" "birds in snow" "birds in winter" "winter animals" "canadian birds" "canadian wildlife"